While you sometimes wish your young lad would stay in safe harbor his whole life, it's hard to complete life's journey without first lifting anchor. We get it, there's a lot out there to be nervous about. The Krakens and Moby Dicks of modern society are all out there beneath the shiny blue surface, you know how scary the high seas can be! The thing is, we all need our own adventures, there's just so much out there for a young sailor to see! While the golden age of sea travel may be over some amazing journeys have happened on the ocean blue. Dressing up as a sailor allows for some pretty awesome imaginings. He'll be battening down the hatches with his shipmates in the biggest storm of the century. Maybe he'll spot a mysterious island in the shape of a skull on the horizon, maybe they'll go to it and discover a group of apes who've learned to build houses and speak in their own complicated language. Hey, he's your kid, who know what he'll imagine! 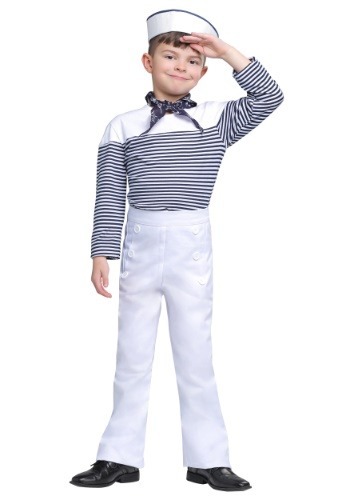 While this vintage sailor suit will make a great Halloween costume with its timeless striped shirt, double buttoned pants, and jaunty sailor cap don't be surprised when it becomes useful in other ways as well. Your kid might want to wear these dress whites while driving his RC boat in the annual race or while throwing candy in the 4th of July parade. You might even be tempted to have a nautically themed family portrait! So, whether your kid is simply hanging out and reading Treasure Island or he's trick-or-treating one thing is for sure, once he's gotten a taste for the wild ocean air it's going to be full steam ahead from here on out!